It’s been a long and beautiful journey of True Love for Emma and Killian, and such a remarkable story indeed. Even without proof it was clear that the love they share is special and true. Emma marching into the Underworld to save Killian by sharing her heart with him was enough to prove the depth of her affection. And although it would’ve been a beautiful parallel to what her parents share, True Love is never easy. It never has been for these two and what was really moving was the way in which they proved their love – through selflessness and sacrifice. Moreover, in the end, although it may not seem as such, Emma and Killian’s hearts were still shared – they are entwined and it was both that connection and their love for each other, and what it inspired in each of them, that granted Killian his life back. True Love did save him. One of the most poignant parts of their True Love test was that it was Emma’s love that was in question. It’s interesting how Emma doesn’t question his love for her. At this point it’s beautiful that there’s not even a doubt of it because he’s proved his love for her over and over again; but then the fact that after all they’ve been through he still isn’t sure he’s worthy enough of the “rarest magic of all” is heartrending. But their test is about both of them ultimately. After nothing happens after Emma places her heart on the pedestal and they both look on devastated, that was the moment the test truly began. Emma fell over in pain needing her heart back in her chest while Killian was engulfed in flames in excruciating torment. But he tells her to get her heart and she saves him from the flames instead. The other person’s well-being was more important than whatever they were suffering. True Love encompasses many things but above all it’s about selflessness – loving someone so much that all that matters is their happiness, their life. This is what allowed them to let go of each other – heartbreaking as it was – and ultimately what saved him. Emma and Killian do not physically share a heart but there is a spiritual and inexplicable connection between them that exists on a profound level. It transcends realms and even death. And it’s what makes their farewell promises to each other so significant. Knowing that there is no leaving Underworld and moving on until one’s unfinished business is complete is why Killian was physically unable to move on. He promised Emma she would not be his unfinished business but he knows that Emma and her family are still in danger from Hades. It’s impossible for him to move on until he knows she is safe. For Emma, she can feel that he is still trapped, still in pain and she cannot grieve for him knowing such. This is what makes Killian’s quest so important for it is not only his love for Emma, but what she inspired within him that saved his life. She inspired the heroism that was always embedded in his soul, and he wouldn’t rest until those he loves were safe. That is beautiful. His peace was knowing they were free from danger. He helped get Emma what she needed and could just feel that she had succeeded, his path to heaven opening up that very instant. And when Zeus tells him it’s time to take him where he belongs it was clear where that was. He belongs with Emma and in the end their connection was his salvation. True Love prevailed. There were so many lovely and significant parallels in the end of the season with episodes that so often remain key to the story, as well as episodes from this season, namely the “Pilot,” “A Land Without Magic,” “Tallahassee,” “New York City Serenade,” and “Swan Song.” I loved seeing a direct mirror of Emma’s walk across the street to catch the man jumping bail in the “Pilot” to Cleo Fox doing the same thing to Emma. It became clear in “Firebird” how much Emma learned from Cleo and that much of her personality was just a mask – her armor was firmly on. It was good for making her brave and confident but it also left her closed off. It’s what makes the Emma we see now such an inspiration. She stronger and braver than she’s ever been for she is not only fierce and confident physically, but emotionally as well, her heart completely open to love, brave enough to love without walls and without condition. The parallels between “Firebird” and “Tallahassee” are also so remarkable – both of the episodes written by Jane Espenson and both revealing key moments in Emma’s past that shaped her life as well as both proving the importance of Killian in her life. The symmetry is so interesting visually and emotionally. They climbed up the beanstalk and descended down into the depths of the Underworld. And in both episodes Emma left Killian behind, the first time because she wasn’t ready to trust her heart, and the last because her heart was filled with True Love. “Firebird” also parallels “A Land Without Magic” in striking ways. In both episodes Emma goes down the elevator in the library to retrieve something to save one of her true loves – Henry with the golden egg, Killian with the ambrosia. Also both times, what Emma sought is not what eventually saved them, it was the true love that did – a True Love’s kiss with Henry and her True Love with Killian that was selfless enough to let each other go and then help him on his quest that granted him his life back. The parallel between their True Love moment and Killian’s sacrifice in “Swan Song” is also significant. In both moments we see one of them in horrible pain but technically not able to die. In “Swan Song” Emma as the Dark One is immortal but she can still feel pain and when Nimue chokes her, Killian wakes up from the darkness and comes back to the light, unwilling to watch the woman he loves in pain. “Firebird” is very much the same. Killian is dead but seeing him being engulfed in a sea of flames was too much for Emma to bear, so she chooses him over her beating heart. They always choose each other. How could anyone doubt the depth of their affection? Their hearts are entwined, sharing a spiritual connection. Cyrus and Killian both want their true loves to let them go, but Alice and Emma are determined to save them. When you truly love someone you can just feel what they are feeling and sense when they are near. Tearful, intense moments where one lay dying and the other begs them not to leave. They can feel each other’s pain and just know and can sense what that they have done. Alice and Emma risked everything, traveling realms to save Cyrus and Killian, and both men are eternally grateful. Although some people were saved and some were lost that premise still rang true until the very end and like the endless tapestry of stories that Once Upon a Time is, each and every choice matters. If you take one thing away it changes the course of the story. It’s interesting how in season two Cora told Killian about Emma “You chose her.”At the time Cora considered it a betrayal. We don’t know how things may have been different if he hadn’t made that first choice. But that choice was the first step in what led them to fall in love and they were all now in the Underworld because of it. And it helped Cora not only able to bring her daughters back together, but helped her find peace with herself and forgiveness from and between her girls. And in the end isn’t it poignant that Killian chooses to forgive Arthur and go on a quest with him that ends up restoring hope in a place that had been desolate for countless souls for years. Arthur found his broken kingdom to restore, so hopefully those souls will no longer be trapped and able to sort through their unfinished business without a vile villain lording over them. And all because of the true love of two very extraordinary heroes. The kisses Emma and Killian shared in the last episodes of season 5 were all so different but each exquisitely moving and beautiful moments for their characters made that way by the real and raw performances of Jennifer Morrison and Colin O’Donoghue. Seeing Killian truly cry for the first time was moving on its own but the moment he took Emma’s hand and kissed it – a moment that that was unscripted – was what made the scene even more stirring. Killian has always been one to hold it together and be strong for Emma. But this goodbye was different. We know how hard it was for Emma but it was also just as hard for him. He had hoped that the life he wanted to share with Emma was going to come true. But here their hope was gone, so saying goodbye was even more devastating. They don’t want to let go but they do – they just want to hold on as long as they can to each other. So he takes her hand and kisses it to show her that loving her was his great honor and grasps it for as long as he can, the looks on their faces ones of devastation and desperation. We’ve never seen that expression or such tears before from him, nor a kiss like this. And it was all made so moving by their extraordinary acting. The kiss that they shared when he miraculously returned is not only one of the most beautiful moments of the series but also one of the most beautifully performed. And I just loved their expressions, signs of affection and the way they try to make sense out of this miracle. They’re incredulous looks were matched in the way they approach each other. Killian can’t quite believe it whilst Emma runs into his arms so overcome with emotion. And the moment when they kiss is so beautiful. When he grabs her tighter, it’s like he couldn’t quite believe she was really there until she was in his arms and once he realizes that he’s going to hold on as tightly as possible. Emma’s amazed, overwhelmed expression here is also as moving as can be as he tries to explain what must’ve happened and she is just watching him with such love and incredible gratitude and that he is there. She still can’t quite believe it and cannot help but kiss him again. Her sweet cheek kisses and their smiles are also as pure as ever. After so much pain and heartache they were able to share a moment of unencumbered joy, before they hold each other looking onto their fallen friend, expressing the way we will cling tighter to those we love in times of tragedy and in times of overwhelming emotion and love. They are grateful but their expressions quickly turn to ones of sadness. No more smiles, just solemn sorrow. So perfectly performed and deeply felt. What is lovely to know is that for as many passionate and heartfelt kisses as they’ve shared he has never picked her up in such an ardent, romantic way. One might think that such a kiss wouldn’t come after a simple “I Love You” but Killian knows how much of a brave step this was for. And consider this: if they kiss like this after an “I love you,” can you imagine the affection they will show each other when they finally express that love physically, as well as ask to share their lives together in marriage. Those will surely be incredible moments of beauty to behold. Sometimes it’s the small things that touch us so much – those little moments that make an already special scene even more so. These were the ones that moved me from the end of 5B. The way they hold each other, the tears, the touches of her face, the way they cradles each other’s heads. It’s so beautiful, intimate and affecting. No one can compare to the beautiful authenticity these two bring to their shared moments. As if kissing her hand wasn’t poignant enough, the way Killian holds Emma’s hand as she slowly ascends, caressing her fingers so tenderly, it’s such a small but meaningful gesture. Their hands entwined has always been a significant part of their story, but what I love in this moment was that whether it was conscious or not, he’s stroking her ring finger. Although we know now that their future can still be bright, at this moment it’s as if he’s telling her he would’ve married her and no matter what their bond will never be broken. It warms my heart every time Emma holds Killian’s hook. It’s such a sweet and loving way of showing she accepts every part of him and for viewers with similarities I can only imagine how lovely it is to see such a positive depiction. It has been a long time coming but seeing David hug Killian made me cry. These two men sure have come a long way – from unlikely allies to friends to family. Killian may be family now because of Emma but he also has become like a brother to David, so the fact that both men lost their brothers again in the Underworld is not lost on me. And seeing David reach out to him, after being so reluctant to trust him for so long is incredibly touching. I would’ve liked a longer, more prominent scene and some dialogue but there’s always next season. For now we have this hug to smile about. In what may be their final have a happy moment together (the incurable optimist in me still believes he perhaps can come back), Robin kisses Regina sweetly, gently rubbing his nose against hers. These little gestures of affection are not only sweet but showcase of realness that is truly lovely. And what I love is that it’s a gesture we’ve seen before. The morning after the first time they made love he does the same thing. In both scenes, they hold onto this moment of intimacy with a gentleness that is so beautiful. David is a favorite character of for a myriad of reasons, one of which is that he is such an affectionate, caring father. We’ve not had many moments with him and his son, but when he takes his baby boy in his arms when he returns from the Underworld smiling and holding him with such adoration I was touched. And see him embracing his wife with the baby between them was so heartwarming. Is that not the picture of true love in all its forms? And perhaps it made him even more grateful because he saw his daughter had to leave her True Love behind for what they thought was forever. Of course now Snow and Charming will no doubt be delighted their daughter can have a happy ending with the man she truly loves. And I long to see before the series ends a similar moment between Emma and Killian with a child of their own. As is often the case they will always be questions that remain unanswered each season. Many I can let go of and forgive but because the finale didn’t resolve everything from season 5 but instead introduced what is essentially next season’s story, there are some significant things that went by the waste side that I still wonder about. – Was the dark curse Killian cast broken? It must have been because they were able to leave town without befalling the same fate as Dopey. So when was it broken? When Killian sacrificed himself? Because he was the one who cast it did his death undo it? -Did Guinevere ever get cured of her Sands of Avalon curse? Was she back to herself once Arthur died? I certainly hope so and that when all of the Camelot folks left she was back to herself and would be able to be reunited with Lancelot. -Why did Merlin have a dark curse brewing before Killian arrived and why did he say Nimue was the only one who could help them to defeat the Dark One? This is perhaps the most glaring unanswered question. There’s so much significance to Merlin’s character and still so much mystery around him, so I hope we’ve not seen the last of him. Henry’s wish came true. The one that Emma loves, the one that loves Emma, found her, and their family became complete. It wouldn’t be the first time water was used as a magical entity. There is a wishing well in Storybrooke connected with the mystical Lake Nostos, the very water that made Emma’s existence possible. There are connections everywhere it seems. Right now it’s unclear what exactly to expect next season. We know the Evil Queen has returned now separated from Regina, but clearly cannot be destroyed because you must learn to live with all you have done no matter how bad it is. Hopefully Regina will learn that. Jekyll and Hyde will also being in Storybrooke, but to what point and purpose I’m not sure. As interesting as these are I do hope there are other big focuses because after a few episodes it may be bit dreary and even repetitive to the 4B storyline. Moreover, Emma is still the main character and every arc has ultimately come back around to her story, so I hope for that to continue. 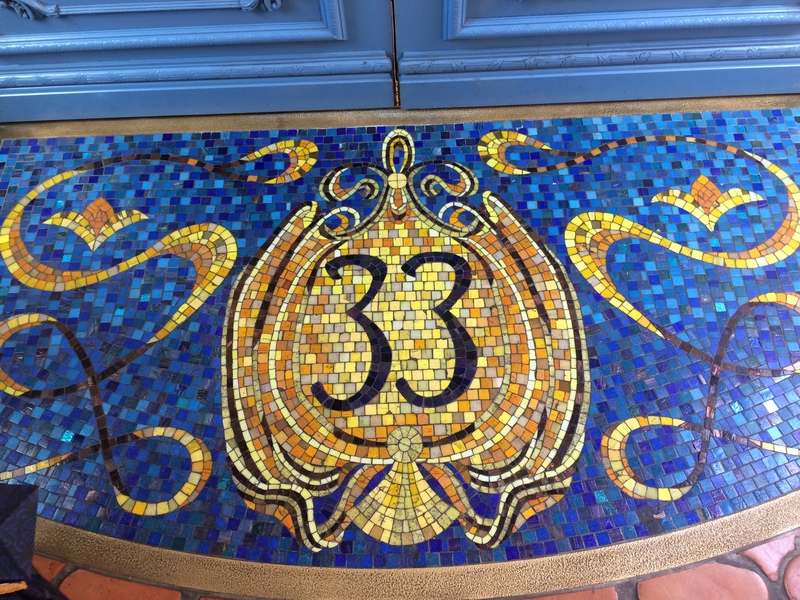 There has not been much talk of what to expect except the possibility of seeing Ruby and Dorothy as well as Maleficent and Lily again. Ruby and Dorothy are cute and sweet, but when it comes to side characters returning they should be compelling if they are to garner screen time, and have a significant connection to the main story. Their episode along with Merida’s in 5A were nice and enjoyable stories out of context but had very little connection to what was going on with the main characters. At this point in the series, I have grown leery and tired of screen time taken away from the main characters. Much like Ariel and Eric, Aurora and Philip, or Cinderella and Thomas, Ruby and Dorothy represent a sweet true love story, but for me if any of these couples are seen again there needs to be a significant link to the main story arc. And honestly I care more about our mains. We shall see what transpires with them. They could be included in a good way. Unlike the new couple whom I like, I cannot say the same for Maleficent and Lily. Well, I actually do like Maleficent, though she was my personal least favorite of the Queens of Darkness. In contrast I could watch Cruella all day long. But Lily on the other hand, similar to the Bae/Neal, I enjoyed the younger persona, but found their older self to be a grating, annoying and very unlikable characterization. Do we really need to know who Lily’s father is? Does a story with her sound compelling and engaging? I know some may disagree, but for me at this point it’s a no. However, I always try to take a positive attitude and not prejudge a story arc until I’ve seen it. Sure there are characters I would rather see return like August, Merlin or Elsa (and they may some day) but we do not dictate the story. We must watch and enjoy what we get. And they have done a beautiful job every year so far. I also thought of ways in which all the things we may see could actually be great, tying into with some scenes with Emma that may ending up being foreshadowing. With the return of the Evil Queen I would love the idea of Emma and Killian being placed in the same position that Snow and Charming were in since the “Pilot,” their love and happiness threatened by the queen. I recently re-watched the episode from Season 4 “Shattered Sight” and wonder if it was a little peak into what we may expect. And I honestly loved that episode. The way Regina reacted against Emma, Snow and David may very be what we will see with the Evil Queen in Season 6. The line Emma said to provoke her so they could get their ribbons off was interesting too: “I wanted you to see me and Hook together- to see the happiness you could never have.” Could that now be foreshadowing of how they will be targeted for having happiness she cannot have? That could be a great story! Moreover, there have been a few scenes that may be foreshadowing that Emma may fall under a sleeping curse: when Emma says she will “sleep for weeks” once Hades is defeated and in 5×23 when Regina pricks Emma’s finger for a tracking spell and Regina asked her why she was hesitant: ” Worried I might make you taken an eternal nap on a bus bench?” If Maleficent does indeed return I could not think of a more amazing thing than to finally see a scene like the iconic hypnotization of Aurora from Sleeping Beauty. In fact, when Maleficent was said to return in 4B I had theorized we might see that with Emma. Alas we did not, but we did see Emma and Killian under a sleeping spell. Might we see a sleeping curse for Emma now? If anyone could pull off this scene in an eerie and compelling way it would be Jennifer. And I for one would love, love, love to see it. And now that she and Killian have been confirmed as True love wouldn’t that be a beautiful parallel to Snow and David’s True Love’s kiss in the show’s very first scene. And remember what happened after that scene- a wedding. Killian is down on one knee, offering his hand to Emma. Killian asks Emma if she was considering marrying Walsh, something she does not discuss with anyone else besides Henry. Past Captain Hook carries Emma bridal style onto the Jolly Roger. Emma is down on her knees and holds up a wedding ring to Killian. During their first date, Emma mentions that Walsh set the bar high by proposing on the date Killian had seen her go on. 4×5 “Breaking Glass” Killian holds up a mood ring from Emma’s box of childhood mementos. The vows to see the best in each other sound a bit like wedding vows. This one may be a stretch but is still lovely. The ball at Camelot looks as if it’s a wedding from Snow helping Emma prepare, to her beautiful white lace dress, to the way she walks toward Killian as he looks at her much like a groom looks onto a bride. The dance they share looks like a wedding! Killian and Emma “ride off into the sunset” on a horse, sharing a romantic love affirmation moment during sunrise in a field of hundreds of pink Middlemist flowers with Emma adorned in a lovely white dress and cloak with a long train. Killian gives Emma a ring saying he’s not proposing, but giving her a symbol of protection and love. Merida talks about taking an arrow to Emma’s knee, an allusion to a wedding and Emma marches down an aisle slowing in the field of Middlemist flowers. When it comes to the wedding dress, I knew we had seen it before, so I decided to go back through every episode (and I mean EVERY episode) to see when it first showed up. And what I found was pretty amazing. At the very least, what has been in this window of the shop “Modern Fashions” since Season 2 has always been tied to Emma, but I would argue it’s been there since Season 1, perhaps not intentional at first, but since season 4 it has undoubtedly been so. In Season 1, you see a Pink dress in the window. No, it’s not Emma’s dress she wore on her date, but it does have that feel. We see this in a few episodes throughout Season 1. In Season 2, the first and truly only time you see the window with any kind of partiality is in 2×10 “The Cricket Game.” The dress is gone, replaced by a sign, as if the store is in transition, (Kind of like Emma). Interesting enough this is the episode right after Killian arrives in Storybrooke. In Season 3, we see the sign remains and we can now see what it says: Coming Soon: One Stop Cobbling. It’s a sign with a shoe. This is striking to me for many reasons. Not only that these scenes are all scenes with Emma in 3×10 “The New Neverland,” 3×12 “New York City Serenade,” and 3×19 “A Curious Thing,” but also that two of these also included Killian. Additionally, shoes are associated with weddings with the tradition of throwing shoes and rice at weddings (Remember that line in Sinatra song The Tender Trap– “the folks are throwing shoes and rice”), as well as tying shoes and cans to couple’s car along with a “Just Married” sign. From Season 4 onward, I have no doubt that what is in this window is connected to Emma. It is pretty remarkable actually. With the exception of the first clear view of the dress and one very important moment, we only see this window in scenes that feature at least one of either Emma or Killian. There are a few instances of groups shots, but we never see a scene with the window in a scene that does not feature either Emma or Killian. That is pretty significant, in my opinion. The wedding dress first appears in 4×1 “A Tale of Two Sisters.” There is a blurry view of it in the group shot at the beginning but it was not clear what it was yet. The first clear view is a scene where Elsa walks down the street- a transition to her remembering Anna trying on her wedding dress. Some may argue that makes the dress connected to Elsa, but in truth it is meant to be related to Emma. Emma and Elsa form a friendship and sisterly bond much like she and Anna. Moreover, every time we see it after that scene it’s with Emma or the man she is destined to marry- Killian. It’s no coincidence that after Emma and Killian shared their first real kiss in 3×22 “There’s No Place Like Home” and are about to embark on a relationship, the sign goes away and the wedding dress is put into the window. The next time we see the dress is the first confirmation that the dress in this window (wedding or otherwise) has a undeniable connection to Emma. AND IT IS MIND BLOWING!!! In 4×2 “White Out,” as the power goes out we see a shot of the window, the light still on and the wedding dress clearly seen. What is amazing is what is in front of the window. It is a bench with the year 1983 on it. WELL 1983 IS THE YEAR EMMA SWAN WAS BORN! As we know, the show began in 2011 and that Emma turned 28 in the “Pilot,” making her birthday October 23, 1983. In 4×10 “Shattered Sight” it is prominently seen behind Emma, and Killian briefly walks by it. In 4×13 “Unforgiven” we see it behind Emma and Killian as they walk hand in hand to Granny’s This is the last time we see the window in season 4. In Season 5, the dress is seen in two significant scenes at the beginning and end of the season. In between, what we see solidifies that the dress in this shop window is meant to be connected to Emma. In 5×2 “The Price” we see the wedding dress in a scene with Dark Swan Emma as she looks on at her loved ones in Granny’s. It’s a powerful image that represents her isolation, her dark present and her bright future. The contrast and dark and light is significant. And then comes something amazing. The next time we see the window is in 5×11 “Swan Song.” The wedding dress has disappeared and replaced with another dress- Emma’s black fitted dress she wore in 5×2. This was most likely a signification that the Dark Swan was able to “die” and indeed in this episode Savior Emma returns. What is mind blowing again is that in the Underworld her dress remains in that window. The underworld is meant to have an equivalent to everything in Storybrooke, so if Emma’s dress is in the window in the Underworld then whatever is in the shop in Storybrooke is meant to be hers as well. Finally, we when arrive back in Storybrooke and the window is seen again, the last and perhaps final and most significant scene occurs. A wedding dress is back in the window to Modern Fashions in 5×23 “An Untold Story.” What’s interesting is that is different dress than the one that we’d seen before- the one Alice wore on her wedding day. Perhaps there is no significance to that, but I do think it’s significant that the season was bookended by two very different scenes with the dress: one where Emma is alone at night- the darkness still within her and Killian, and then with the two of them during the day, free from the darkness and ready for a bright future together. In this moment Emma tells Killian she loves him for the first time simply because she wants to. The placement of the gown is also important as the dress is in clear and beautiful view, perfectly centered between them – the first time that has ever happened. This is the final exquisite sign that this wedding dress in meant for her. It always has been. We don’t know when, but a wedding is surely on the horizon for Emma and Killian. The signs are there. They have proven their True Love. And when they finally have their happy day it will undoubtedly be as beautiful as anything we’ve ever seen. This week’s Further Thoughts are, like last week, a bit shorter as I was able to cover a lot in my Nerd Machine review. A lot of this is basically reliving the glorious moments of my favorite episode of Season 5 thus far. I loved every single moment!! I don’t think I will ever grow tired of watching or discussing this beautiful scene. It’s the most gorgeous, romantic, fairy tale perfect moment I have ever seen Once Upon a Time! 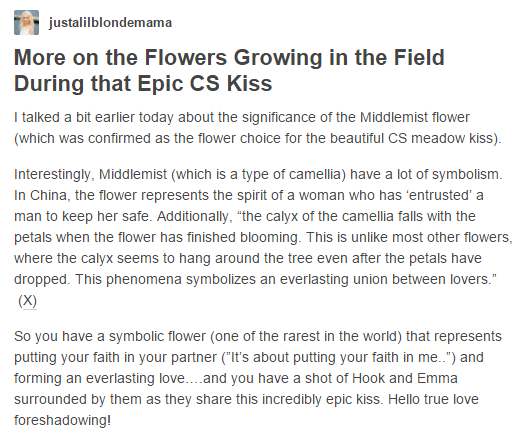 I spoke a lot about the symbolism of the pink blossoms in my review, but I stumbled across this amazing post on tumblr which has some additional, and very apropos thoughts. Bravo to justalilblondemama for your research and thoughts!! I am also reminded of a paper I wrote in college about the symbolic use of nature in Pride and Prejudice. In that I discussed when the characters are outdoors they are more free and honest with their feelings, as opposed to when they are inside where they are more repressed. This feels quite similar to the way this scene played out. Away from the confines of the castle she is able to breathe again. Outside, Emma is honest and able to share and trust Killian, helping quiet the darkness inside of her. Moreover, this further reiterates the difference between the ways the flowers are presented for Emma and Killian and Arthur and Guinevere. Inside the castle tower, Arthur creates a bouquet for Guinevere with the sands of Avalon and takes always her freedom to choose. Inside the castle she is living a repressed, false life. But for Emma and Killian they are outside in a glorious meadow created by nature, where they both are choosing to believe and trust in each other and their love. It is no wonder, this special moment garnered such stunning direction to match the beauty of what this means for this true love couple. Speaking of Pride and Prejudice, although the Captain Swan moment was unique and lovely, I could not help but be reminded of the scene from 2005 version with Keira Knightly and Matthew Macfadyen, also known as one of the most resplendent films in history. The scene where Darcy walks across the meadow towards Elizabeth and the two share a romantic moment as the sun rises behind them is simply glorious, and when the sunlight was peaking through the trees behind Emma and Killian it was so reminiscent of the Darcy and Elizabeth moment. The sunlight represents love, renewal of feelings, and a promise of fidelity. The sun always rises each day, and the love for these couples remains as constant. 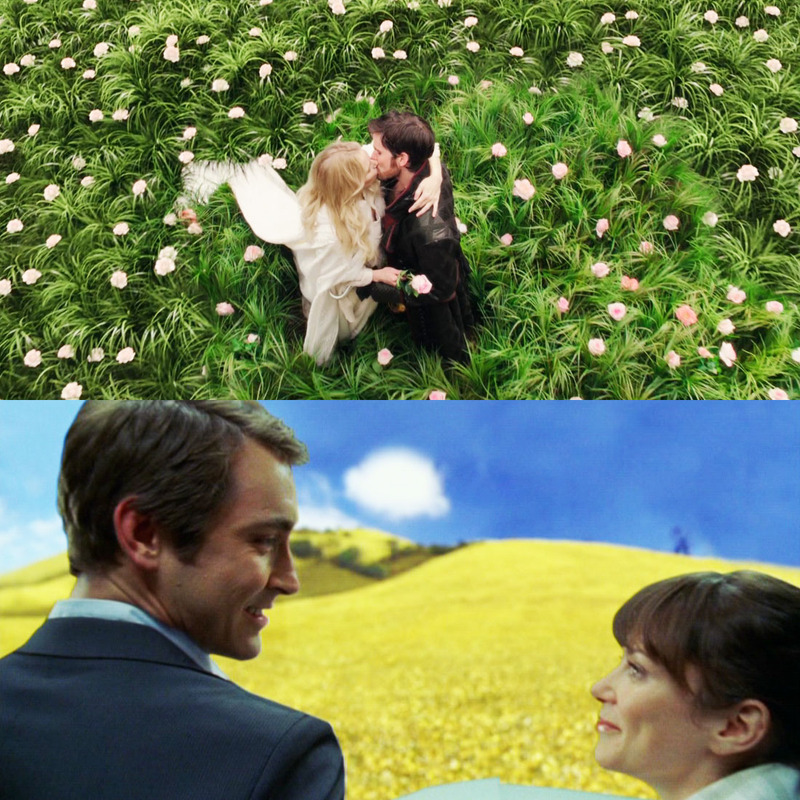 This scene on the meadow was also reminiscent of another sweet, beautiful fairy tale like moment. When I watched the show with my Mom it was the first words out of her mouth. She said “It’s just like Pushing Daisies.” And she was right. Both pan to a felid of flowers as a couple shares a sweet romantic moment. I still miss this show every day. Jennifer Morrison is such a remarkable actress for many reasons, one of these being her consistency. She does gestures and expressions consistently for Emma. Any time Emma is rendered speechless and her love is as clear as the look on her eyes, so gives an expression where you can see her try to say something but simply cannot, so she lets her eyes (and often her lips) do the taking. We have seen this many times, but was there any more beautiful than the one on this episode. Similar to Jennifer, Colin is also a brilliant and consistent actor with his portrayal of Killian, and I think we all swoon anytime he arches his eyebrow. This moment in particular is wonderful because it is a combination of recognition of what she means with her words “Now that we’re alone,” and love, as his affection for her is shining right there in his eyes. Although they have done it before, this episode seemed to be the first time that both Emma and Killian used so much dialogue that referred to them as not only a united couple but one that has a future together. We can see that they are not only together (which we already know), but for the first time on both their parts that they want this to be forever. “We” can get back to the white picket fence life. I will never stop fighting for “us.” Emma and Killian are strong individuals but together they are unstoppable and more importantly they are united and joined by the bonds of love, and want to be forever! I just had to mention this adorable scene between Emma, Killian and Henry again. They are going to have such a cute family dynamic- heck they already do. Emma will be the supportive but cautious mother. Killian will be the playfully teasing “That’s my boy” kind of step dad. It’s all kinds of adorable and sweet and I hope we see more Captain Cobra Swan scenes in the future because they’re golden. The wedding foreshadowing seems to be in overdrive this season, first with “The Price” and now in “The Broken Kingdom” and I do not believe we are reading too much into it. We are seeing things that are common marriage, wedding and happily ever after visuals and aspects. Emma and Killian ride off into the sunset, she is wearing a white dress and cloak with a long train, she holds a flower (while they are surrounded by flowers) while they kiss after promising to always fight for their future together. I think the question is not if Emma and Killian wed, it’s only a matter of when. I found Arthur’s line to Snow and Charming about himself and Guinevere so interesting. He says, “You’re not the only couple whose hearts beat as one,” and it makes me wonder if this is a foreshadowing clue. We know that Snow and Charming share a heart, but we also know that what Arthur is claiming about him and his wife is far from the truth. And I doubt it will ever be the case. I wonder if it is a hint that Emma and Killian may end up sharing one. It is just interesting that we hear this line in the episode where Emma shares her burden with Killian and it helps her quiet the darkness. The love they share can defeat anything, it seems like the possibility that they may share a heart even more likely. 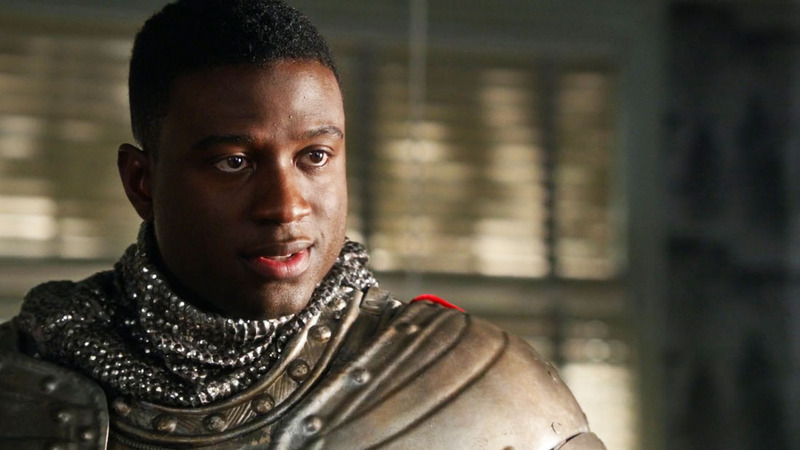 The fact that we have not seen Lancelot in Storybrooke is alarming and I hope his character has not died, mostly because I really love him. His love for Guinevere feels true as he was able to tell she was not herself and under a spell, something only a true love would be able to recognize. 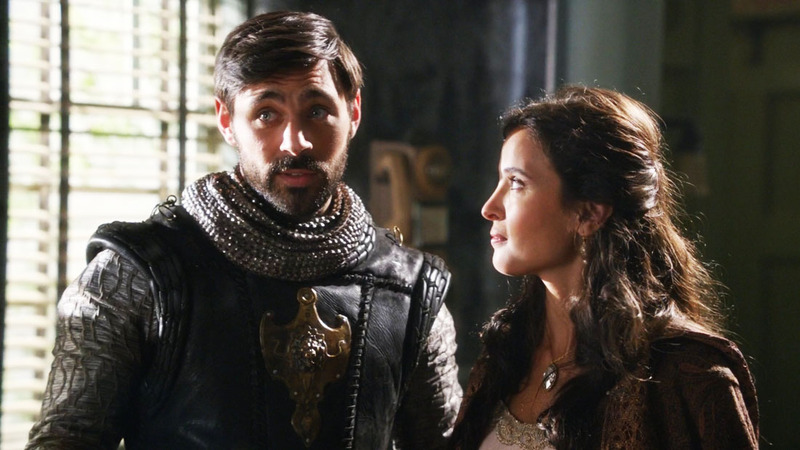 I already adored him because without his (and Ruth’s) actions Emma would never have been born. I hope nothing has happened to this gallant knight. What I find intriguing about Merlin’s prophecy that Arthur is the one to pull Excalibur from the stone and be the rightful ruler of Camelot, is that it is only from Arhur’s perspective. Right now we have only heard Merlin say his warning to Emma as a child. As far as his other prophecies they are all though Arthur. Did he misunderstand or assume things? Is Arthur even the rightful ruler? He is not acting very kingly because a true ruler would not have to use magic to fix his kingdom. Could Merlin’s prophecy be referring to somebody else?